John, by the grace of God, king of England, lord of Ireland, duke of Normandy and Aquitaine, and count of Anjou, to the archbishop, bishops, abbots, earls, barons, justiciaries, foresters, sheriffs, stewards, servants, and to all his bailiffs and liege subjects, greetings. Know that, having regard to God and for the salvation of our soul, and those of all our ancestors and heirs, and unto the honour of God and the advancement of his holy Church and for the rectifying of our realm, we have granted as underwritten by advice of our venerable fathers, Stephen, archbishop of Canterbury, primate of all England and cardinal of the holy Roman Church, Henry, archbishop of Dublin, William of London, Peter of Winchester, Jocelyn of Bath and Glastonbury, Hugh of Lincoln, Walter of Worcester, William of Coventry, Benedict of Rochester, bishops; of Master Pandulf, subdeacon and member of the household of our lord the Pope, of brother Aymeric (master of the Knights of the Temple in England), and of the illustrious men William Marshal, earl of Pembroke, William, earl of Salisbury, William, earl of Warenne, William, earl of Arundel, Alan of Galloway (constable of Scotland), Waren Fitz Gerold, Peter Fitz Herbert, Hubert De Burgh (seneschal of Poitou), Hugh de Neville, Matthew Fitz Herbert, Thomas Basset, Alan Basset, Philip d’Aubigny, Robert of Roppesley, John Marshal, John Fitz Hugh, and others, our liegemen. 2. If any of our earls or barons, or others holding of us in chief by military service shall have died, and at the time of his death his heir shall be full of age and owe „relief“, he shall have his inheritance by the old relief, to wit, the heir or heirs of an earl, for the whole barony of an earl by Ł100; the heir or heirs of a baron, Ł100 for a whole barony; the heir or heirs of a knight, 100s, at most, and whoever owes less let him give less, according to the ancient custom of fees. 5. The guardian, moreover, so long as he has the wardship of the land, shall keep up the houses, parks, fishponds, stables, mills, and other things pertaining to the land, out of the issues of the same land; and he shall restore to the heir, when he has come to full age, all his land, stocked with ploughs and wainage, according as the season of husbandry shall require, and the issues of the land can reasonable bear. 16. No one shall be distrained for performance of greater service for a knight’s fee, or for any other free tenement, than is due stink. 18. Inquests of novel disseisin, of mort stanch, and of darrein presentment shall not be held elsewhere than in their own county courts, and that in manner following; We, or, if we should be out of the realm, our chief justiciar, will send two justiciaries through every county four times a year, who shall alone with four knights of the county chosen by the county, hold the said assizes in the county court, on the day and in the place of meeting of that court. 20. A freeman shall not be amerced for a slight offense, except in accordance with the degree of the offense; and for a grave offense he shall be amerced in accordance with the gravity of the offense, yet saving always his „contentment“; and a merchant in the same way, saving his „merchandise“; and a villein shall be amerced in the same way, saving his „wainage“ if they have fallen into our mercy: and none of the aforesaid amercements shall be imposed except by the oath of honest men of the neighbourhood. 26. If anyone holding of us a lay fief shall die, and our sheriff or bailiff shall exhibit our letters patent of summons for a debt which the deceased owed us, it shall be lawful for our sheriff or bailiff to attach and enrol the chattels of the deceased, found upon the lay fief, to the value of that debt, at the sight of law worthy men, provided always that nothing whatever be thence removed until the debt which is evident shall be fully paid to us; and the residue shall be left to the executors to fulfil the will of the deceased; and if there be nothing due from him to us, all the chattels shall go to the deceased, saving to his wife and children their reasonable shares. 29. No constable shall compel any knight to give money in lieu of castle‑guard, when he is willing to perform it in his own person, or (if he himself cannot do it from any reasonable cause) then by another responsible man. Further, if we have led or sent him upon military service, he shall be relieved from guard in proportion to the time during which he has been on service because of us. 35. Let there be one measure of wine throughout our whole realm; and one measure of ale; and one measure of corn, to wit, „the London quarter“; and one width of cloth (whether dyed, or russet, or „halberget“), to wit, two ells within the selvedges; of weights also let it be as of measures. 37. If anyone holds of us by fee‑farm, either by socage or by burgage, or of any other land by knight’s service, we will not (by reason of that fee‑farm, socage, or burgage), have the wardship of the heir, or of such land of his as if of the fief of that other; nor shall we have wardship of that fee‑farm, socage, or burgage, unless such fee‑farm owes knight’s service. We will not by reason of any small serjeancy which anyone may hold of us by the service of rendering to us knives, arrows, or the like, have wardship of his heir or of the land which he holds of another lord by knight’s service. 38. No bailiff for the future shall, upon his own unsupported complaint, put anyone to his „law“, without credible witnesses brought for this purposes. 42. It shall be lawful in future for anyone (excepting always those imprisoned or outlawed in accordance with the law of the kingdom, and natives of any country at war with us, and merchants, who shall be treated as if above provided) to leave our kingdom and to return, safe and secure by land and water, except for a short period in time of war, on grounds of public policy‑ reserving always the allegiance due to us. 47. All forests that have been made such in our time shall forthwith be disafforested; and a similar course shall be followed with regard to river banks that have been placed „in defense“ by us in our time. 61. Since, moveover, for God and the amendment of our kingdom and for the better allaying of the quarrel that has arisen between us and our barons, we have granted all these concessions, desirous that they should enjoy them in complete and firm endurance forever, we give and grant to them the underwritten security, namely, that the barons choose five and twenty barons of the kingdom, whomsoever they will, who shall be bound with all their might, to observe and hold, and cause to be observed, the peace and liberties we have granted and confirmed to them by this our present Charter, so that if we, or our justiciar, or our bailiffs or any one of our officers, shall in anything be at fault towards anyone, or shall have broken any one of the articles of this peace or of this security, and the offense be notified to four barons of the foresaid five and twenty, the said four barons shall repair to us (or our justiciar, if we are out of the realm) and, laying the transgression before us, petition to have that transgression redressed without delay. And if we shall not have corrected the transgression (or, in the event of our being out of the realm, if our justiciar shall not have corrected it) within forty days, reckoning from the time it has been intimated to us (or to our justiciar, if we should be out of the realm), the four barons aforesaid shall refer that matter to the rest of the five and twenty barons, and those five and twenty barons shall, together with the community of the whole realm, distrain and distress us in all possible ways, namely, by seizing our castles, lands, possessions, and in any other way they can, until redress has been obtained as they deem fit, saving harmless our own person, and the persons of our queen and children; and when redress has been obtained, they shall resume their old relations towards us. And let whoever in the country desires it, swear to obey the orders of the said five and twenty barons for the execution of all the aforesaid matters, and along with them, to molest us to the utmost of his power; and we publicly and freely grant leave to everyone who wishes to swear, and we shall never forbid anyone to swear. All those, moveover, in the land who of themselves and of their own accord are unwilling to swear to the twenty five to help them in constraining and molesting us, we shall by our command compel the same to swear to the effect foresaid. And if any one of the five and twenty barons shall have died or departed from the land, or be incapacitated in any other manner which would prevent the foresaid provisions being carried out, those of the said twenty five barons who are left shall choose another in his place according to their own judgment, and he shall be sworn in the same way as the others. Further, in all matters, the execution of which is entrusted to these twenty five barons, if perchance these twenty five are present and disagree about anything, or if some of them, after being summoned, are unwilling or unable to be present, that which the majority of those present ordain or command shall be held as fixed and established, exactly as if the whole twenty five had concurred in this; and the said twenty five shall swear that they will faithfully observe all that is aforesaid, and cause it to be observed with all their might. And we shall procure nothing from anyone, directly or indirectly, whereby any part of these concessions and liberties might be revoked or diminished; and if any such things has been procured, let it be void and null, and we shall never use it personally or by another. 63. Wherefore we will and firmly order that the English Church be free, and that the men in our kingdom have and hold all the aforesaid liberties, rights, and concessions, well and peaceably, freely and quietly, fully and wholly, for themselves and their heirs, of us and our heirs, in all respects and in all places forever, as is aforesaid. An oath, moreover, has been taken, as well on our part as on the art of the barons, that all these conditions aforesaid shall be kept in good faith and without evil intent. Given under our hand ‑ the above named and many others being witnesses ‑ in the meadow which is called Runnymede, between Windsor and Staines, on the fifteenth day of June, in the seventeenth year of our reign. 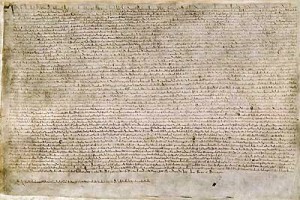 Comments: This is one of three different translations I found of the Magna Carta; it was originally done in Latin, probably by the Archbishop, Stephen Langton. It was in force for only a few months, when it was violated by the king. Just over a year later, with no resolution to the war, the king died, being succeeded by his 9‑year old son, Henry III. 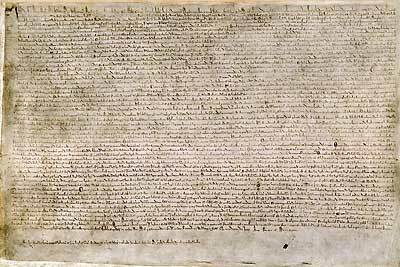 The Charter (Carta) was reissued again, with some revisions, in 1216, 1217 and 1225. As near as I can tell, the version presented here is the one that preceded all of the others; nearly all of it’s provisions were soon superceded by other laws, and none of it is effective today. The two other versions I found each professed to be the original, as well. The basic intent of each is the same. ‑ Gerald Murphy (The Cleveland Free‑Net ‑ aa300) Prepared by Nancy Troutman (The Cleveland Free‑Net ‑ aa345) Distributed by the Cybercasting Services Division of the National Public Telecomputing Network (NPTN). Permission is hereby given to download, reprint, and/or otherwise redistribute this file, provided appropriate point of origin credit is given to the preparer(s) and the National Public Telecomputing Network.